The Group of Seven issued a joint statement today that shows a breach between the United States and key allies over the Paris climate deal. 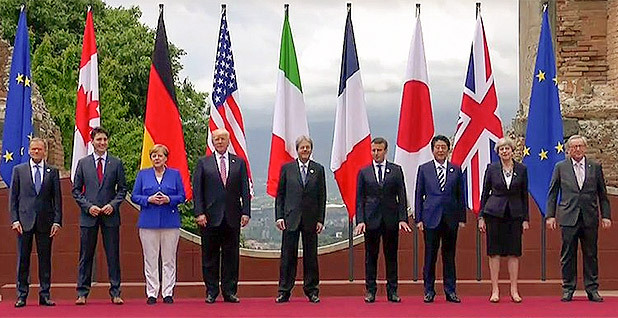 The communiqué from Taormina, Italy, shows six of the seven-member developed countries enthusiastically supporting the agreement, while President Trump hangs back. 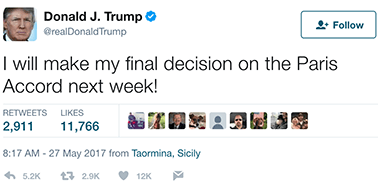 "I will make my final decision on the Paris Accord next week!" Trump tweeted this morning. The communiqué states that the United States is "in the process of reviewing its policies on climate change and on the Paris Agreement." Canada, France, Germany, Italy, Japan and the United Kingdom affirmed "strong commitment" to the agreement. Italian Prime Minister Paolo Gentiloni said the United States remains in a "phase of revision" on Paris that he hopes will finish soon. Environmentalists had hoped that Trump would bow to heavy persuasion from his European counterparts and announce during this weekend's summit that the United States would remain in the 2015 deal. But they applauded the other G-7 members for not watering down their own support for Paris to avoid showing a split with the United States. "He is isolating the U.S. from our most important allies, and those allies stood strong in the face of backsliding," said Heather Coleman, climate director at Oxfam America. Trump's announcement means he is likely to meet with principal advisers on either side of the issue next week before making his choice.